The consensus is clear that the most popular clarinet quintet is by Mozart (104 recordings), followed by the Brahms (87), which is modelled upon Mozart’s work. No other piece rivals this pair in popularity, even though the literature includes such gems as quintets by Weber and Reger. 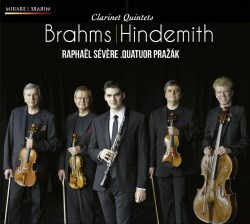 Raphaël Sévère and the Pražák Quartet nudge us to open our ears to another under-performed clarinet quintet, the 1923 piece by Paul Hindemith, here recorded in its 1954 revision. Most readers will regard the Brahms as the main event. Despite its homage to Mozart’s structure, it is a unique work, offering most clearly the “autumnal” quality many find in Brahms’ late compositions. Duller musicians can turn autumnal to gloomy, but this performance finds a contented, sun-dappled mellowing of age. Sévère is a young French musician, playing with the Pražák Quartet, who are old hands. This is a happy combination, with lots of passion, an extended range of expression, and playing that is both intense and carefully calibrated. The detailed recording helps overcome the work's occasional tendency toward murkiness. The clarinet’s distinctive array of voices make it interesting for composers to combine with four strings. The instrument’s lower registers blend well, its upper ones not at all. Given that the clarinet can hide among strings in the mid-range so much better than other winds, it is not always the solo. Brahms places the clarinet as a bottom to the ensemble in one passage, blending with the viola and cello in another, then rising in its soprano to shine over the whole ensemble in another. This is an eventful work, although some performances undercut that by over-emphasizing its liquid, honeyed moments, and avoiding drawing attention to the firm bones of the piece. Sévère and the Pražák adopt sharper rhythms than some, especially in the hunt-like music of the first movement. They are especially eloquent in the Adagio, with its deliberately unstable rhythms. Hindemith will never melt hearts like Brahms, and in truth his quintet is one more bracing salvo in the 1920s assault on stuffy pre-war musical tradition. It is contemporary with Hindemith’s Piano Suite 1922, his String Quartets 4 and 5, and several of the concertos in the Kammermusiken series. Far from being an homage to Brahms, the work seems to exorcize the older master. Dramatic and lyrical impulses alternate over five movements. The two slow movements are dreamy, but in a nearly surreal manner, quite unlike the calming restfulness of Brahms. In the opening movement, the clarinet cries out with ecstasy, like a Messiaen angel singing out above the strings. In the middle movement, Sévère switches to an E flat instrument to underscore his wild ride above the strings, signalling abandonment of all musical decorum. The fifth and final movement, in a classic Hindemith trick, turns out to be the first movement played backwards - how appropriate for the Mirare label. The 1954 version is said to remove some of the rough edges of the original, but it remains a boisterous piece. An MDG recording by the Ensemble Villa Musica offers the 1923 version (review). In this case, Hindemith’s revision strengthened the work. The CD booklet provides an intelligent essay that links Brahms and Hindemith as being on other sides of the shattering cultural event that was World War I. In sum, these are fine performances of two very different clarinet quintets, opening the mind to the wonderful things that can be done with this combination of instruments. Who is now up for trying Reicha, Bliss or Ben-Haim?